Little Fire Ant - Welcome Coffee Growers! The Little Fire Ant (Wasmannia auropunctata) is spreading throughout Hawaii. They are found on the Big Island and have also been located on Oahu, Maui and Lanai. at the bases of leaves from large-leaved plants (especially palms, banana, ti, dracaena plants, etc). LFA will also inhabit coffee trees and will tend green scale and other insects in the tree and on leaves. 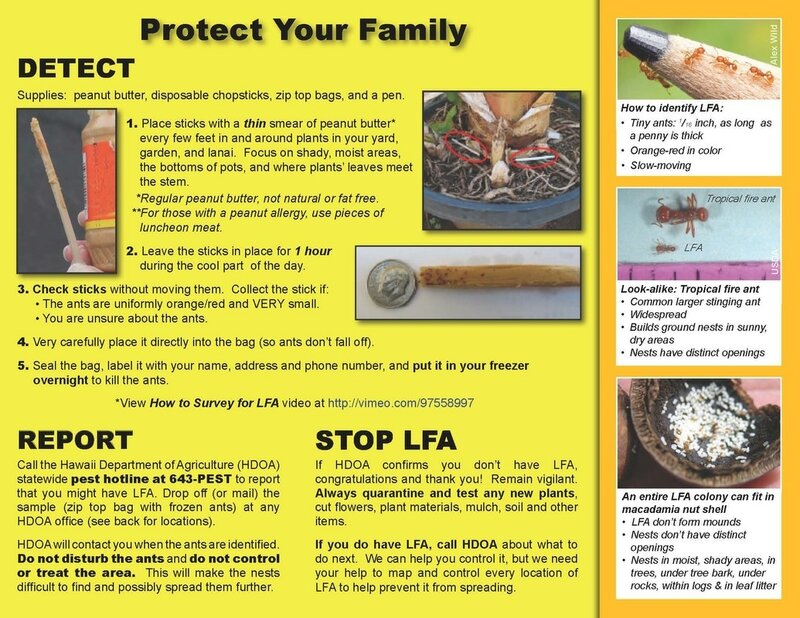 Not only do LFA protect and help spread unwanted insect pests throughout trees and farms, these ants also bite and cause harm to humans, animals and pets. ​Learn how to detect and prevent their spread and introduction onto your property and farm, as well as how to treat for and manage these tiny ants. 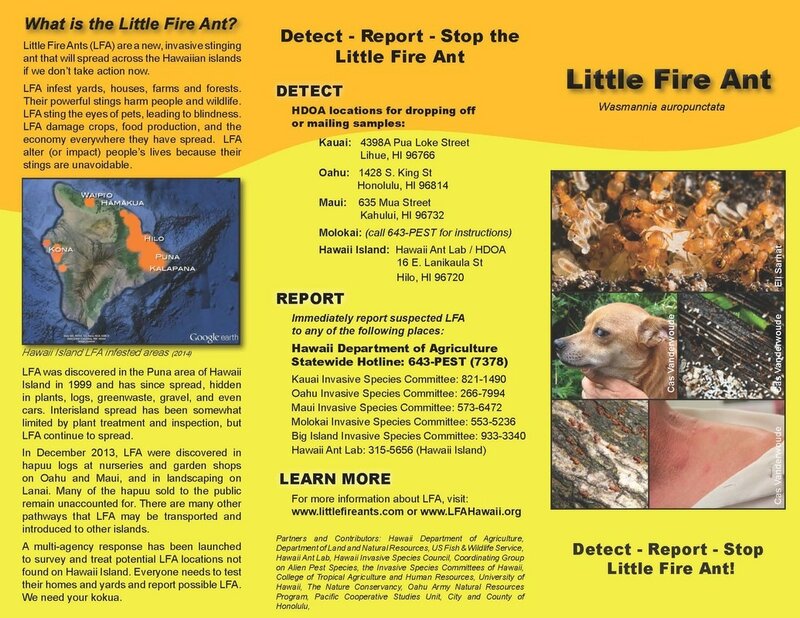 Stop the Little Fire Ant! 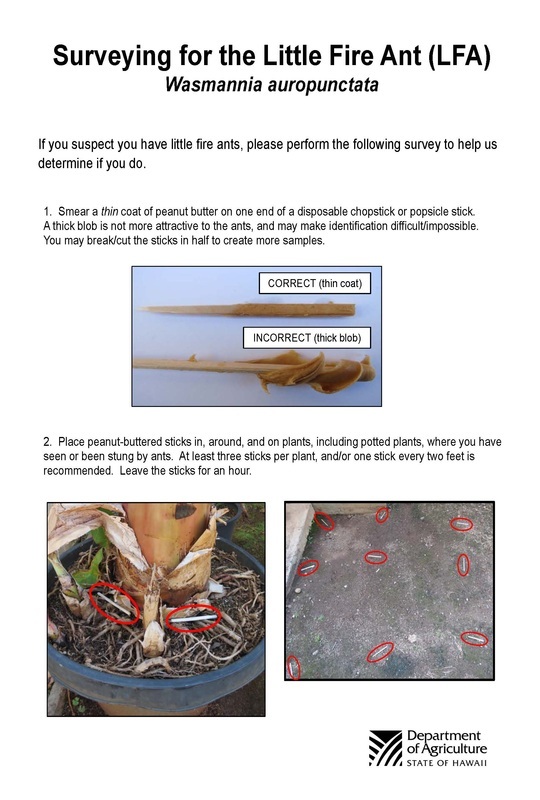 ​​The County of Hawai‘i has launched a Little Fire Ant (LFA) voucher program to encourage residents to attend training workshops and reduce the initial costs for selected ant bait toxicants and hand spreaders. A limited supply of vouchers will be available to adults age 18 and over who have attended and completed a LFA Workshop. 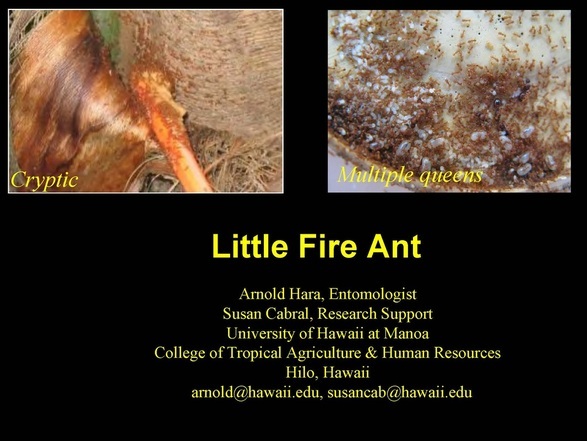 Free LFA Workshops hosted by the Department of Research and Development and led by the Hawai‘i Ant Lab will be held at the Aupuni Center Conference Room in Hilo, and at the Kona Extension Office in Kealakekua. Workshops are open to anyone interested in learning more about the Little Fire Ant’s biology, habits, life cycle, and appropriate control measures. Seating is limited and registration is required. For more information, visit http://www.hawaiicounty.gov/rd-agriculture. To register for a class, visit http://bit.ly/2fTK40a for Hilo and http://bit.ly/2eYWIvx for Kona. Big News! Provaunt now available for HAL gel bait! After about 4 years of negotiations, we finally have a "Special Needs Permit" to allow Provaunt to be used in the HAL gel bait. Provaunt contains indoxacarb which is a new class of pesticide with a very low non-target toxicity. It works very differently from Tango and is very fast acting. Ideally, I would recommend that people use Tango for 3-4 treatments, then switch to Provaunt bait. This combination would have the best overall effect - the Tango disabling the queens, followed by Provaunt to wipe out any survivors. We use this combination approach with the eradications on Maui, Kauai and Oahu and it has been very effective. Click here to view the Special Local Needs Label Permit for Provaunt. Provaunt is approved for use to control LFA in and around residential, recreational, natural and commercial landscapes, golf courses and other non-crop areas (including non-bearing fruit and nut trees and vines grown in the listed use sites). 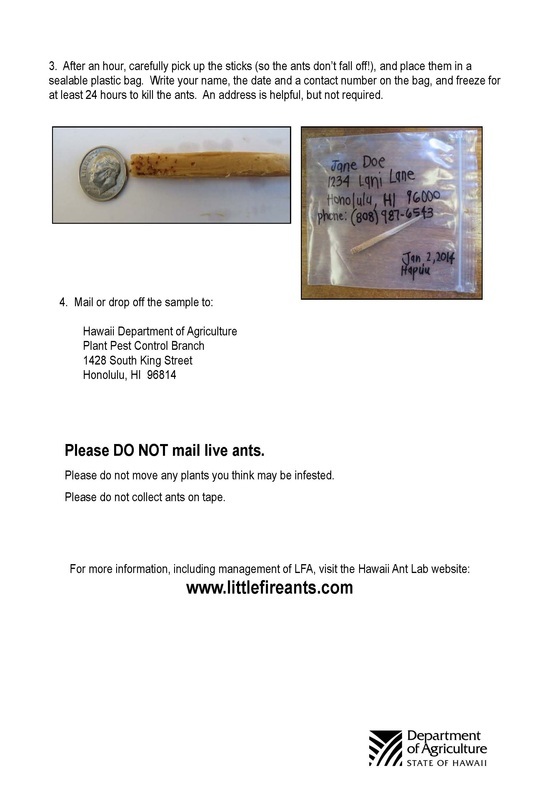 Please contact the Hawaii Ant Lab for more information. One of the newest techniques to eradicating and managing Little Fire Ants (LFA) in an orchard, is with the use of a product called Tango™. This bait gel matrix which contains Tango, water, corn oil or other vegetable oil, xanthan gum, and smooth peanut butter, was created by HAL in Hilo and has been successful at eradicating small colonies of LFA in Hawaii. Tango is a concentrate pesticide that contains S-methoprene, which is an insect growth regulator (IGR). This IGR group of chemicals works by preventing affected insect larvae from completing the pupation process but has no effect on adult worker ants. It also prevents or slows down egg production by the queen. Ant colonies baited with an IGR slowly die out over a period of months. One big advantage of methoprene is that it is one of the safest insecticides available today. For this reason, it is often used for insect control in food crops and even drinking water. Additionally, it is extremely effective as an ant bait when used correctly. The main disadvantage of this product is that it takes longer to control insect pests because only egg production and larvae are affected, while the adults can live on. In today’s world, we often expect quick results and for some people 3 months is a long time to wait for initial results. Insect growth regulators are very effective, especially for long term management. You must be patient and dedicated to allow this product to control LFA and possibly eradicate small populations. Multiple 4-6 week applications are required and can span the duration of a year or more for best results. Click here to learn how to correctly use Tango and to create the bait gel. Also included, is a list of suppliers of Tango.